Recently, I ran across another of those atheist memes that have become popular online. As I've demonstrated before, these little quips, while attractive on the surface, usually make huge errors in thinking. However, since Christians are likely to run across similar objections to their faith from skeptics or others, I do think it can be educational to take some of these apart. 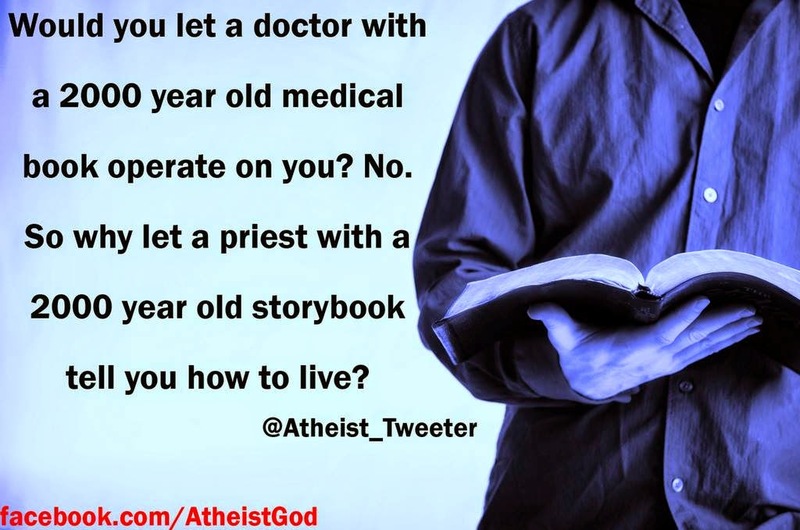 The latest meme has a simple image of a man's torso holding a Bible, accompanied by the statement/question "Would you let a doctor with a 2000 year old medical book operate on you? No. So why let a priest with a 2000 year old storybook tell you how to live?" Leaving aside the loaded language of "2000 year old storybook," the meme tried to do two things at once. First, it tries to make a comparison between a medical procedure and matters of faith. Secondly, by so doing, it argues that because a text is old it is somehow deficient. Let's take these claims in order. I would like to take these claims in reverse order, but the careful reader should note that the meme is wrong in its claim that people don't allow doctors with ancient medical books operate on them. Acupuncture predates Christianity by thousands of years and I have known many people who reject the wisdom of the Bible but embrace it as a treatment for their ailments. The practice has received enough attention that the Journal of the American Medical Association and the British medical journal Lancet have written articles on the practice.1 Whether the relief people feel from acupuncture is due to the procedure or simply a placebo effect, acupuncture patients will tell you that they continue to have treatments because it helps them.2 So, many people do let a medical practitioner with an ancient "medical book" operate on them. The main error the meme commits is shown by those people who continue to pay of acupuncture. It doesn't matter how old a procedure is; the real question is "does it work" or "is it true." In logic, dismissing an idea because it comes from an old source is a form of the genetic fallacy. If you aren't familiar with the term, a genetic fallacy is a mistake in logic where a person claims the falsehood of an idea simply because of its origin. For example, I learned from my school teacher that 2 + 2 = 4. But if my teacher is later found to be a habitual liar, it doesn't mean that I must now reject the notion that 2 + 2 = 4! She could have lied about everything else, but that idea is actually true. Similarly, one cannot dismiss the Bible as a source of wisdom on life simply because it is old. In fact, unlike medical procedures, which are more mechanical, issues of life are universal. This is why we require students to read Shakespeare, Boethius, and Homer—because we can learn from them, even though they are ancient. Human beings have faced the same big questions of life since our origin, and these are not things where the answers come more easily with better technical expertise. So, the meme is asking the wrong questions. It doesn't matter how old a text is. What should be asked is "Is the text true?" For that we have strong evidence that the Bible is what it claims to be: the word of God given to men so they may find the answers to those big questions of life. Perhaps if the meme's creator had spent more time reading Aristotle's 2,300 year old writings on logic, he may not have made such an egregious error. 2. To be sure, the efficacy of acupuncture is highly debated in the medical community. One of the most difficult problems, as the Lancet mentioned is that it becomes difficult to create a control group for a blind study when the procedure itself requires one to have needles inserted into the body. Regardless, the falsity of the "no" answer in the meme is proven. 3. Crawshaw, R. "The Hippocratic Oath. Is Alive and Well in North America." National Center for Biotechnology Information. U.S. National Library of Medicine, 08 Oct. 1994. Web. 21 Oct. 2014. .